Decided to take a year off from Arizona, and purchased the New Mexico State Parks Pass. For a mere $225 a year (non resident) I am allowed to stay at any of there 29 state parks for up to 2 weeks, then you can either leave for a week before returning, or move on to the next one. Not the best pic, but all state parks highlighted in green, and elevation's for each of them written down a good tool to avoid the cold, and beat the heat. Departure should be early next week waiting on one last item in the mail. Then my 9 month adventure begins. If anyone knows of any parks with zero cell service it would be great to know, it is my lively hood. Thanks for visiting! Good Day! Check Barbara's blog at Me and My Dog...and My RV. She spends a lot of time in NW state parks. Happy trails! Thanks I read her blog, but will have to go back and revisit. Smart! Look forward to your report on the various NM State Parks. The only one I have visited (just for one night) was Oliver Lee SP. I was blown away by its beauty and feeling of remoteness. I remember I had excellent wi-fi because I Skyped with DH and was able to take the laptop outside and show him the stunning view that surrounded me. Cool! Good to know. Plan on hitting Oliver at the end of the season. Ryan, I know you like to hike, so if you don`t fallow the blond coyote you should check her website out. She lives in New Mexico Travels everywhere there, and reports all the best hiking trails. And the places to camp for free. Thanks Dan, Ill definitely go check it out. 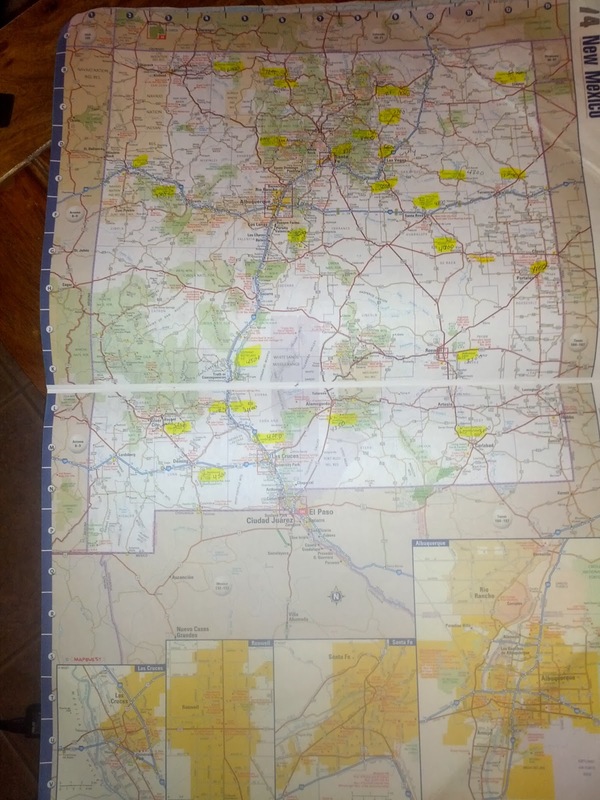 Got my atlas map so Ill be doing boondocking as well. He's lived in the NM State Parks for years. Only blogs once a month or two but has a wealth of information. Hey Steve. Its a year from the date of purchase. Not calendar year. Eastern Az is pretty as well. This is my plan for this summer too. That pass is great. I take it you are starting at the southern end and working your way up. Good plan. I'm afraid I will be leaving to late to go that route. Enjoy! Looking forward to it. I am sure are paths will cross again. Usually have pretty good luck running into you in the middle of no where,and no luck when I am sitting in the same spot for 4 months LOL. Sounds like a great plan for the year! Was in NM many years ago, the White Sands to visit, and they were pretty cool. I am looking forward to spring here in Western NC too. Glad you got some good advise from others - want to see some pics from where you and Candy land! Andy has a page that details each park's assets, including cell phone and internet service. Find it at http://www.andybaird.com/nmsp/names.htm Use it like an app. BTW some parks also have free WiFi. Add $4 per day if you need a site with electric. Otherwise, as you said, no additional cost. I got my ACP on Dec 2 and have used NMSP for most of this winter. The pass is good for one year and until the last day of the month purchased. So, in my case it is good for 13 months; meaning the cost is only 57 cents per day for me. However, I'm not likely to be here for the entire year. Still a good deal though.